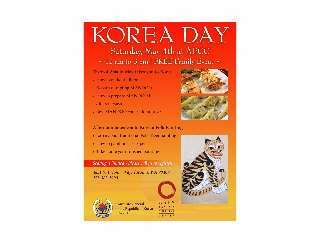 Korean Consulate General Seattle office support, this is APCC 5th year free Korea Day event. We want participants to have the hands-on experience along with cultural story telling to learn about Korean culture. Monthly Taste of Asia in May will be Korea, so participants will get to learn about Korean Mandoo, dumpling making, and how to prepare in different ways. We will also have "who will make the best looking Mandoo" contest. Afternoon will be fun with ink on rice paper to make "Min Wha" which is folk painting of traditional Tiger along with story behind. Each participant will take their finished painting home.